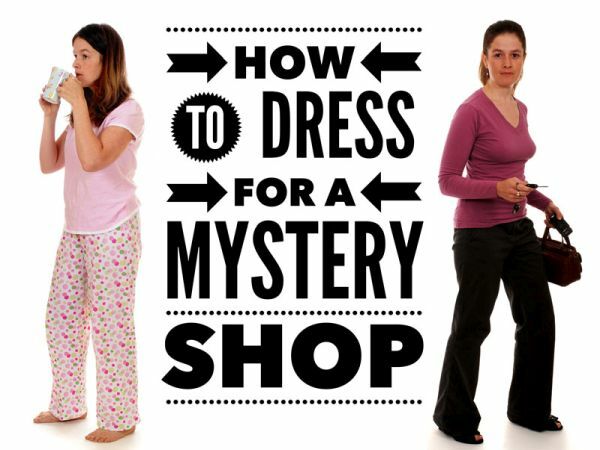 You are here: Home / Secret Shopper How-To / How Should I Dress for Mystery Shops? The most important consideration is how other customers dress. Mystery shoppers need to look and act like other customers of the business. We need to blend in and not stand out because we are very under- or over-dressed. Let’s look at a few examples. Appropriate attire for fine dining shops is generally going to be dressier than for a fast food shop. Some fine dining restaurants have dress codes, for example requiring men to wear jackets and ties. On the other hand, if the restaurant is in a resort area, the dress code and customer style may be more casual, with some diners even wearing shorts! Fast food shops obviously do not have a dress code (beyond “no shirt, no shoes, no service”) but you will still want to consider how other customers will be dressed. A fast food place in a downtown business district will have a lunch crowd of business persons in suits and dresses. If the restaurant is in an industrial area, customers may be wearing work clothes or uniforms. In a suburban mall, you will find just about every kind of clothing you can imagine. Dress to fit in, wherever you will be. There are shops that take us into banks, property management offices and other professional settings. When you are in a professional environment, dress the part. That doesn’t necessarily mean a business suit, but slacks and a nice collared shirt for men is usually a good choice. Women should wear the equivalent: slacks or skirt with a blouse or neat top, or a dress. Clothing worn on a mystery shop should not be too tight or revealing. How you dress for a retail shop will depend on the type of store and its location. Doing a mystery shop on Rodeo Drive in Beverly Hills would be a different situation than one at a big box discount store. The way you dress can affect how you are treated by a salesperson. You may think that it shouldn’t, and that employees should treat everyone the same, but that is probably not what you are being asked to evaluate. The client usually wants a typical interaction, not a shopper who is trying to test the sales staff to see if they will assist someone who looks like a bum. Remember Pretty Woman? Although it was satisfying for Julia Roberts’ character to take that snooty sales woman down a notch, she did not look like a customer who could afford what the store offered. It is probably never appropriate to wear cutoffs and a bikini top, or to wear clothes that are in poor condition, such as jeans with holes and tears. Along with wearing clothes that will allow you to blend in with other customers, also consider your grooming and hygiene. Remember that you are a professional, and you are representing the mystery shopping company (even though you do not identify yourself as the mystery shopper during the shop). There are times when the client will check surveillance video to see what happened during the shop, and they will see that the mystery shopper was the woman wearing pajama bottoms and flip flops, with her hair in curlers. Yikes! If you are not sure of the appropriate attire to wear on a shop, ask the scheduler. She can tell you what the client expects.